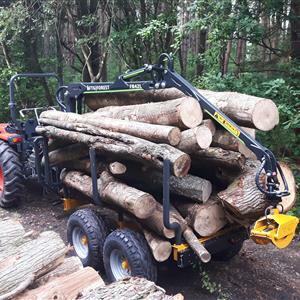 The M151-4WD is Moheda's biggest trailer aimed at forest owners, professional foresters and contractors. A powerful trailer built for tough days in the forest. With the M75 crane this trailer can be compared to a smaller forwarder. 600/50x22.5 wheels with reinforced rims, disc brakeson two wheels and rear lights as standard. Load sensing hydraulic system optional. Folding support legs and 4-wheel brakes are optional.